Surfal Medemdemia, Kurubel Medemdemia, and Hirut Erge take a practice test in Blair's new TOEFL preparation class. Blair is offering a new course to help students prepare for the TOEFL (Test of English as a Foreign Language) exam starting this semester. The TOEFL exam is a test that colleges use to measure the English ability of non-native English-speaking students. This exam gives students another chance to get into a college that requires the SAT (Scholastic Aptitude Test) if they are not native English speakers and they don't do well on the English part of the SAT. The test is mainly for non-native English-speaking students who have been in the U.S. for 5 years or less and students who live in other countries and want to come to the U.S. for college. 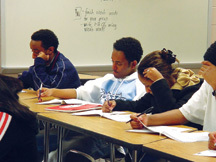 Other high schools in Montgomery County have had a TOEFL course for a few years. Mr. Bill Donnelly teaches the course at Sherwood High School to juniors and seniors in ESOL level 4 and 5. He stated that many students get various benefits from taking the TOEFL course. Mr. Donnelly, who is in his third year of teaching the TOEFL course at Sherwood, said, "It gives the students a more advanced exposure to English, as well as helps them with test-taking skills." Another ESOL teacher, Mr. William Bolin from Wootton High School who used to teach the course at Einstein High School said, "Offering this course provides more information about each student's English proficiency and may assist him or her in getting into college." The teachers prepare the students on the English grammar, reading comprehension, writing skills, listening skills and give practice for the real test. "We use several TOEFL books as well as give the students a lot of practice tests to help them overcome their fear of the test as well as show them their strengths and weaknesses," Mr. Donnelly said. "Everything is covered in the TOEFL booklets which we get it in our career center." The teacher who is teaching the TOEFL course at Blair is Ms. Tomesek an ESOL teacher. "I hope that it will be a good prep for people who take the class. They will know what to expect from the TOEFL test," Ms. Tomesek said. Ms. Tomesek has major plans for the TOEFL class. "I want to cover the main part on the test. Give them the overall expectations like practice on timing and other test-taking skills." Ms. Tomesek believes that test-taking strategies are helpful for anyone who takes any tests. Another part of the course is helping students sign up to take the test. Mr. Bolin said that at Einstein High School, students needed to call the testing center to make an appointment in order to take the TOEFL test. Online registration is also a convenient way to make an appointment for the test. There is a fee for this test. The test costs $130, but there are usually fee reductions for certain students. Students can get more information about this program from their counselor and career center.